Sometimes mixes can feel a little cluttered, especially when the song features a dense instrumentation. As audio engineers, we have to find creative ways to manage the density of the projects that we are working on. The side chain input on a compressor can be a useful tool for managing this musical density. Typically, a compressor provides more gain reduction to a track when the audio on that channel is at a higher level of gain. 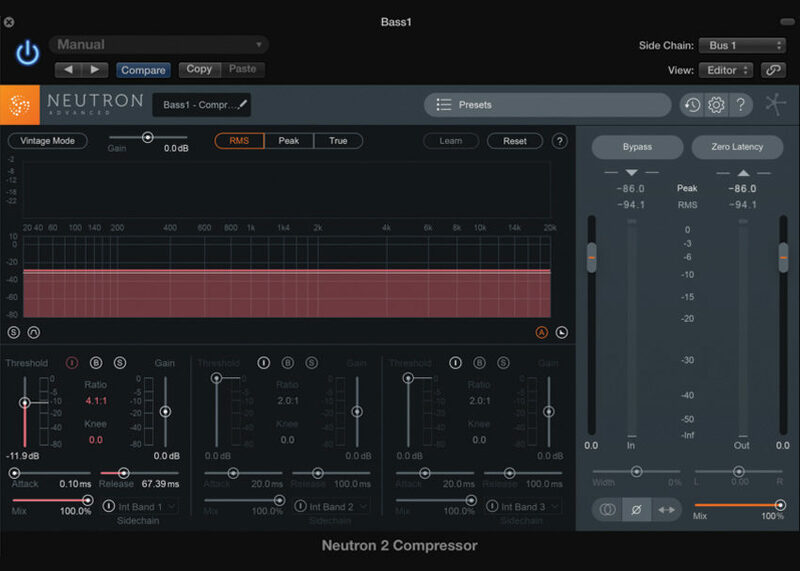 The side chain input allows you to change the source material that is triggering the compressor’s gain reduction. When you are using the side chain input, the compressor will not react to the volume of the channel that it is on. Instead, it will be listening to the audio of a different channel and it will be compressing it more based on the audio routed to the side-chain input. This is called side-chain compression. Side-chain compression is most commonly used when dealing with instruments that provide a lot of low end. For example, many engineers and producers will put side-chain compression on their bass tracks. They trigger the compression on the bass with the kick drum. This pulls the volume of the bass down every time the kick hits and allows the kick drum to provide a more compelling impact. EDM producers will sometimes even side-chain a majority of the instrumentation to the kick, dramatically pulling everything down whenever the kick hits. When working with funk-influenced drum patterns, side-chain compression can help add life to the hi-hat pattern. 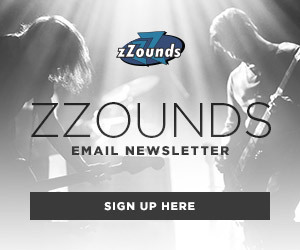 Mick Guzauski, a multi-platinum audio engineer, has a wonderful video on how he uses this. In his video, he shows how he side-chained the hi-hat to the kick drum. While the difference is subtle, you’ll notice that the hi-hats feel far more expressive as their dynamics are pulled down when the kick hits and pushed up when it’s not there. Providing more space for the kick drum to hit can really add life to your mix, and often makes the song feel more upbeat. Mick Guzauski is the engineer behind many amazing albums by artists such as Daft Punk, Pharrell Williams, Jamiroquai, and more. I highly recommend listening to the mixes that he’s done, as he is a master at the clean-and-crisp funk sound. Side-chain compression does not work for every song, but it is certainly a valuable addition to our audio tool set. I am going to show you how to side-chain your bass to the kick drum. 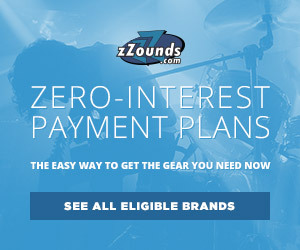 First, you will need to send your kick drum to an auxiliary send. You will use this auxiliary send as the compressor’s side-chain input. For the example, I sent my kick drum to Bus 1. Now, place a compressor on your bass track. 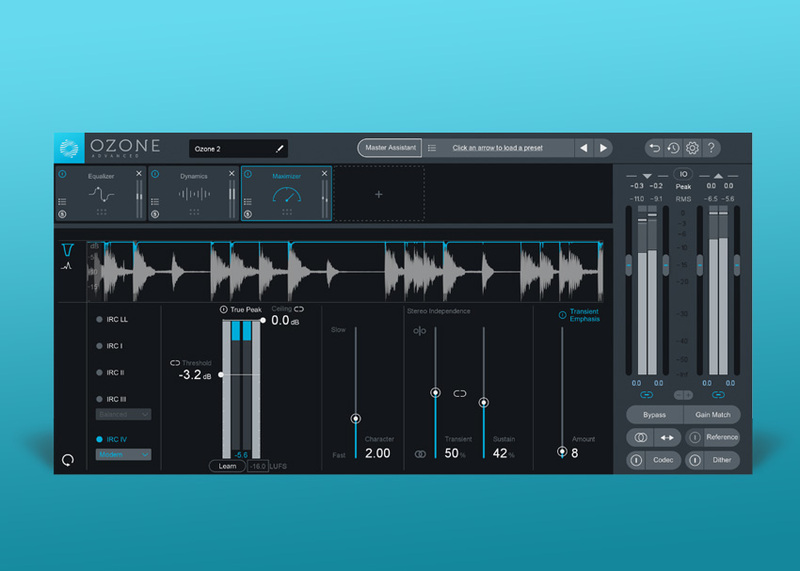 Today we will be using Izotope’s Neutron 2. If you are using Logic, the side-chain input of the compressor will be located in the top right-hand corner of the plug-in’s window. Open up that drop down menu, and select Bus 1 as your input. The drop down menu will select the external audio source. After you’ve selected Bus 1, engage the icon that looks like an “i” with a circle around it and select “Ext Full”. 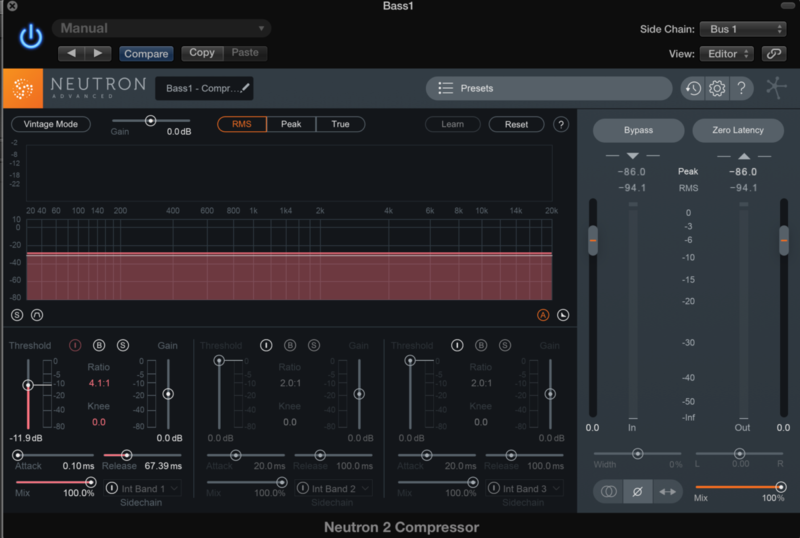 Now, the compressor will react to the audio that was sent to Bus 1. Once this is done, you need to dial in the compressor’s parameters to get the perfect amount of gain reduction. I placed the ratio at 4.1:1, as I find that this is a subtle, yet effective, amount of compression. I set the threshold to only do about 4dB of gain reduction. The exact value of the threshold is dependent on the level of the compressor’s input signal, but you typically want to dial it in to a point that it’s providing 3-6dB of gain reduction. Next, I set the attack as low as I could (0.10ms). A low attack time will adjust the compressor to start its gain reduction almost immediately after the kick hits. The release time is dependent on the specific kick drum you are using. 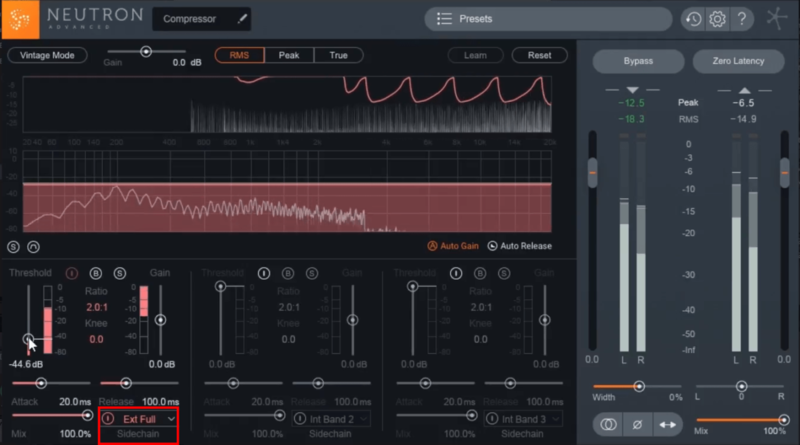 You want the bass’s volume to get pulled down for the majority of the kick’s initial peak, but you want the compressor’s gain reduction meter to make it back to unity before the next kick hits. Typically, I set my release time to make it back to unity shortly before the completion of the kick drum’s sustain. For my kick, I found that 67.39ms was the perfect release time for my compressor. After you’ve dialed in all of those parameters, you will be side-chaining your bass to your kick. While the kick drum plays a crucial role in the examples I have provided, you do not have to use the kick drum as a source. Side-chaining can be a helpful tool if there are any two tracks that are battling to take up the same frequency range in your mix. Experiment on your tracks and see if you can find other uses!